Winter is NOT giving up! This was ANOTHER weekend of powder skiing ! A review of Mores Creek "snow water equivalent" (SWE) chart shows that we continue on track for average snow year. The offset between precipitation and SWE lines are due due to the October "rain" (no snow) precipitation. The SWE chart is valuable in tracking the point at which we hit the maximum snow depth for the season. After the maximum is reached, and SWE start to decrease, then the snowpack enters a transition from winter to isothermal. A transitional snowpack deserves attention to avoid wet slabs and other type of wet snow slides. The biggest concern early on the transitional phase are wet slabs, since they are unpredictable, can be large, and are as destructive as mid-winter dry-slabs. As the snowpack starts warm-up and generate free water, wet slab avalanches instability results due to the interaction of a weak layer and free water. Wet slab avalanches are more likely when 'persistent weak layers' (PWL) are present in the snowpack. Keep in mind that this year the Central Idaho snowpack region developed several PWL that could be re-activated. such as the SCARY Thanksgiving rain crust involved in many of this year avy incidents! Also there is evidence of other PWL formed during the March high pressure. And as you will see later on this blog there is new potentially problematic layer at ~30 cm,. Please be prudent and EXTRA watchful, since this PWL can easily become active during the warming of the snowpack in the upcoming days. I spent Sunday - April 6th visiting Bogus Basin sidecountry. There were two areas I wanted to visit before the season is over; Bob's Knob and The North Fork of the Clear Creek. Last year meager amounts of snow did not allow to ski this areas in optimum conditions. Today's skiing was invigorating; creamy snow on east aspects, and surprisingly nice powder at North aspects above 6000 feet. At or below 6000 feet elevations a carvable and supportable base was evident at all aspects. There was a thin crust at E aspects under the new 8 cm of new snow, but I rarely felt it. Ski penetration of 30 cm on the new 8 cm snow and the old low density + 20 cm snow was an effective cushion, that kept edges away from the nasty crusts buried deeper in the pack. The bad news is that the temps were warm, 0 degrees C in the morning to a moderately balmy 6 degrees C in the afternoon. I will be surprised if a new crust did not develop on the new snow. The trick for this week is to head to higher elevations - hint - Banner Summit / Copper Mountain Area! Last Wednesday two friends skied at Freeman, and one of them (Mark) shared with me that there was a funky slab developing at North and NE exposures. Mark emphasized that it was not the typical snow temperature densification, but that something did not feel right! Such observation also motivated me to get to the backcountry and take a look careful at the snowpack. The layer of concern is 30 cm deep. The strength for the 30 cm slab was moderate (several CT and ECT produced scores of 12). The shear quality was Q2 with "sudden collapses" but not planar failures, suggesting moderate fracture initiation energy. 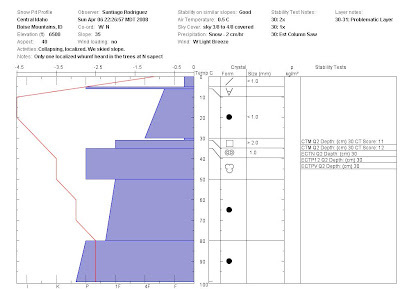 But it FAILED fracture propagation tests such as the NEW Canadian Extended Saw Test and the Extended Column Compression test. The Extended Column test (ECT) test was repeated several times due to the fact that the "Extended Column Saw" test was VERY energetic in propagation the fracture and collapsing the one meter long column! A total of three standard ECT tests were performed, but only one failed. The failures occurred above a thin crust, where a thin layer of facets averaging 2 mm in size were present. There were some 3 mm facets crystals too. In summary, we have a snowpack with moderate strength, moderate fracture initiation energy, available energy for fracture propagation, and poor structure (weak layer in the top meter, weak layer thinner than 10 com, weak layer consists of persistent grain type - facets, difference of more than 1 mm in grain size, and hardness difference of more than 1 step on the layers of concern). I use a methodology that incorporates snowpack strength, fracture initiation, fracture propagation and snowpack structure as independent risk factors in order to minimize "FALSE STABLES". After completing the snowpit, while breaking trail on a protected North aspect lightly timber and shady spot, a localized whumf was experienced. Furthermore, while trail-breaking some localized steep rolls exhibited slab instability. Interestingly enough, these areas were always in protected aspects, suggesting a recent surface hoar event. Q2 scores and other observations suggest that the snowpack is gaining strength, not surprising considering the warm temperatures. It is likely that similar stability assessment could apply to Mores Creek Summit and other Central Idaho Mountains since surface hoar or near surface faceting tends to affect a large region. Before moving on - take a look at the Snow Pit recorded temperatures - SO FAR ... there are no indications that the snowpack above 6000 feet at NW, N, and NE aspects is becoming isothermal. We will have to wait a little bit longer for consolidated and corn skiing on those aspects. Below a short video clip of Bob's Knob. 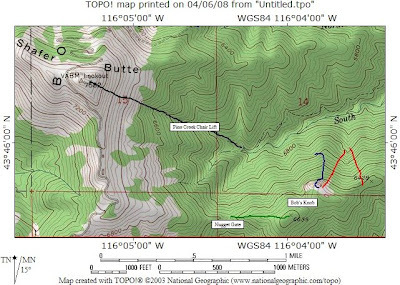 The following topo map shows the location of Bob's knob. The green line shows the access most people use to get to Bob's knob. The Blue line is the access used by few others. As usual the red line is where I skied. The next picture shows the run (tree run in the near horizon) to the right in red in the above topo map. The next picture was taken halfway down from the run in the left in the topo map. But the BEST skiing today was found at the headwaters of the North Fork of the Clear Creek, to the south-east of Deer point. The snow on this basin is very protected from the winds, particularly the W and NW winds. A topo map for this area in included below. 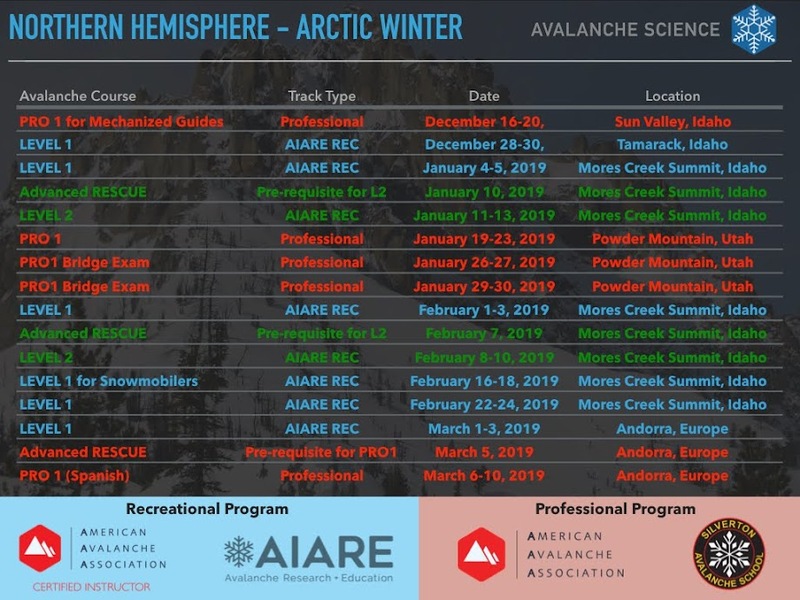 My hope is that by sharing on this blog other places besides the well known Mores Mountain, Pilot Peak, and Freeman Peak areas will encourage the backcounrty users to explore least known areas of Bogus sidecountry and Mores Creek Summit.